Since the firestorm that erupted following the proposal of the Park 51 development—the so-called “Ground Zero Mosque”—in Manhattan in 2010, mosques have come to symbolize controversy and division for many Americans. Since that time, mosque developments nationwide have faced resistance from neighbors as well as municipal officials and have been the focus of intense media scrutiny. One might have the sense that mosque development is inherently controversial and that mosques—and perhaps even Muslims themselves—are incompatible with American ideals and American communities. Many myths have emerged regarding mosques in the United States, including that they are sources of radicalization among American Muslims, that they are led by extremist clergy, and that they host practices that border on the occult. None of this could be further from the truth. 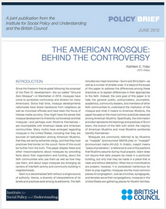 This paper dispels these and other misconceptions about mosques by providing facts about their organization and funding, about the faith communities who use them as well as how they use them, and about ways mosques are emerging as centers of interfaith activity and community building in neighborhoods. Published in partnership with the British Council.